Essential Fatty Acids: (Omega-3, Omega-6, and Omega-9). These polyunsaturated essential fatty acids help lower LDL (harmful cholesterol) while maintaining HDL (beneficial cholesterol). This unique ratio resembles the same combination as olive oil. Omega fatty acids combat heart disease by increasing healthy cell development. 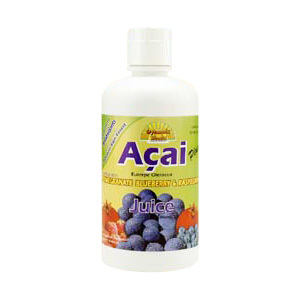 Omega fatty acids are essential for healthy nervous system development and regeneration. They help rapidly repair and rejuvenate muscles after intense exercise. Essential fatty acids (Omega-3 in particular) help the brain to run smoothly. A Very High ORAC Product! 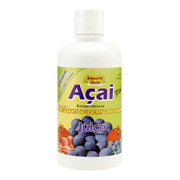 Acai Juice Blend is shipped in a discrete, unmarked package. Orders are processed immediately and usually take about 3 to 5 working days to be received. We do ask that you try it for 2 to 3 weeks to feel the full effects. Any information received is used only for order processing and shipping purposes. Your information, such as e-mail address, will never be disclosed to a third party.